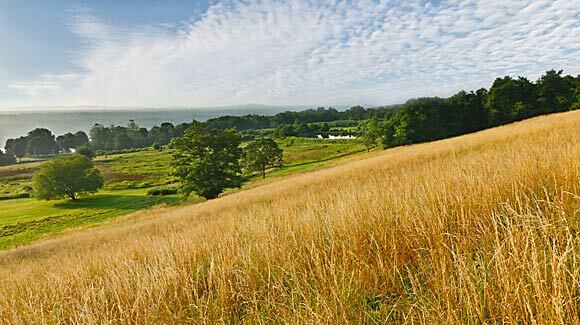 These beautiful fields are permanently protected from development.Robert Rodriguez, Jr.
Acquisition of a conservation easement on this property's scenic meadows and wooded hillside—lands highly attractive for residential development—ensures they will always contribute to spectacular vistas from the Home of Franklin D. Roosevelt and Vanderbilt Mansion National Historic Sites, two of the region's top tourism destinations. It also safeguards a perennial stream that flows through the land before reaching the Hudson River. The property is located within the state-designated Grand Pond/Chodikee Lake Biologically Important Area (BIA), whose A rating means its habitats are of the highest importance. Its meadows not only provide a critical feeding and nesting area for grassland birds, but (along with land's wooded areas) collect and purify water that filters into the ground to recharge the local aquifer, a community's prime source of drinking water. The woodlands also sequester carbon and other harmful pollutants.